There are several different ways you could choose to get started with Game Maker. You could download tutorials, fiddle around with examples, buy a book or play around in the IDE. When I started using Game Maker there were no English-language books devoted to introducing the software so I was more limited in my options. It is therefore interesting to see how I could have been introduced to Game Maker if I were to stumble across it for the first time today. The recently published Getting Started with Game Maker by Jerry Lee Ford [read our interview with Jerry] aims to introduce Game Maker and teach basic game development and programming principles. The book is divided into three sections. In the first Ford provides an overview of the Game Maker IDE to help the reader get a feel for the software they will be using. 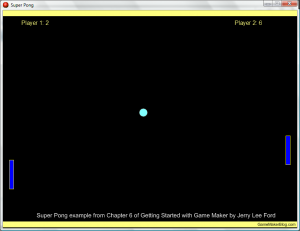 The second part of the book teaches development using Game Maker’s drag-and-drop functionality through the creation of four games, whilst the final section introduces coding in Game Maker Language culminating in the production of a space invaders clone. Written for use with Game Maker 7 Getting Started with Game Maker positions itself at a level prior to The Game Maker’s Apprentice with the book Mark Overmars co-authored being recommended as “a good next step for beginning Game Maker developers”. The book is written assuming the reader has no prior game making knowledge and emphasises the ability to be able to create games without having to learn a programming language heavily in the opening chapter. The vast majority of examples can be completed with the free (Lite) version of Game Maker although Pro is needed for some of the topics covered towards the end of the book. Ford says upgrading is “well worth” $20 (the current upgrade cost is actually $25). Whereas other books or tutorials may feature practical instructions from the offset Getting Started with Game Maker provides a thorough introduction to the different areas of Game Maker before commencing any game creation. This may be frustrating for those wanting to dive straight into making games but I believe this format is more beneficial allowing game development to progress more rapidly once the necessary basics have been explained. After the first section each chapter starts by introducing new elements of Game Maker or a game design topic and culminates in the production of a game. For example in chapter 3 Ford discusses the merits of using power-ups and difficulty settings within your game to maintain user interest and the GML section includes an introduction to the areas of iteration and selection. Working through the games taught threw up some unexpected problems as right from the very outset (a simple Bouncing Balls program) instructions were missing. In this instance it was the omission of a step to add a background image to the room but unfortunately this wasn’t a one off. Perhaps this could be overlooked had it of occurred later on in the book but in the opening chapters of a book aimed at total beginners this is likely to confuse and irritate readers. Each game is created following a seemingly untouchable pattern. First import all resources used in the game, second create and program the objects and finally place objects in rooms. This is unrealistic particularly with the complete lack of mid-creation testing which should surely be encouraged and is only touched up on in the final chapter. There are a few generalisations towards the start of the first section, such as stating that in Game Maker 30 steps equates to one second and that sprites have transparent backgrounds, however full explanations of these are given later on. “Tricks” boxes throughout the book contain useful shortcuts which can make your programming more efficient and some of them were certainly new to me. The promised series of ‘challenges’ at the end of each chapter never materialised which I found disappointing. Of the games taught three are two-player games presumably this is to make creation more interesting as you can play the finished games with a friend or family member. I was quite surprised however to see that neither a platform game or a maze game were included as these both leave lots of room for extension as opposed to the fairly narrow scope of the specific arcade games. Throughout images are given for reference consisting mainly of clearly annotated screenshots of the Game Maker IDE but there are also a few diagrams to illustrate concepts and 7 pages of easy to use reference tables for all of Game Maker’s drag-and-drop actions. Good naming practise is taught with all objects, scripts and sprites being given suitable prefixes to avoid confusion when coding and all Game Maker Language code is fully commented to explain the intended actions. On a couple of occasions I spotted a younger sibling (who is aware of but does not use Game Maker) flicking through the book and he seemed pretty interested in the arcade style games taught throughout the book even though I beat him at them! The language used should ensure that the book is understood by children as all technical words are explained when they are introduced and there is also an online glossary. 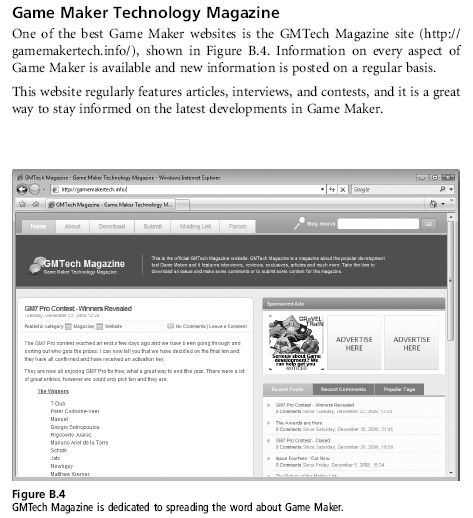 As well as teaching game creation the book also explains how to use the YoYo Games website to distribute finished projects and an appendix provides details of websites providing further information about Game Maker. The resources needed are either included with the Game Maker 7 download or are available from the publisher’s website [download here] where both the graphics required, the source code for the completed games and appendices can be found. Verdict: A good all-round introduction to using Game Maker to create games from the basics of drag-and-drop through to GML. The topics covered at the start of each chapter can easily be transferred to programming in other languages. Seems a shame that the book was released when it was. A couple of months later and it could have been released for use with Game Maker 8 and would probably receive more attention as well as ensuring it is correct for the version most people will be using. Pages: 318. Black and white. why would someone make a book on game maker? game maker isnt hard. game maker isnt even programming. @Jonathan Martin Please can we keep your spurious claims about browser share out of a discussion about a book. Nope, Research has showen FireFox is on top and still growing even more. @tuntis These are Jerry’s screenshots not mine and surely it makes sense to use IE as I believe it is still the most used browser. I used internet explorer till the new version got installed on this machine, I cannot tolerate it, so I use Chrome. it is the Fastest browser I have seen yet. Nice review, though there are a few grammatical errors in it. Sorry to point that out, it’s just, for me at least, more difficult to read when there are run on sentences and the like. As I said though, nice review. Although my days of actually using Game Maker are long gone, I’m sure this well help out beginners to Game Maker in many a way. I only wish I had this five years ago!